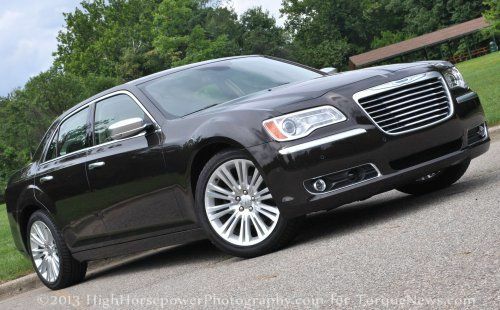 While attending a recent Automotive Press Association meeting, Chrysler brand president and CEO Saad Chehab stated that the company is currently looking at offering a diesel powered Chrysler 300 sedan – reinforcing a long running rumor that has been supported recently by the introduction of the new 3.0L V6 EcoDiesel engine for other Chrysler Group products. Considering the fact that the new 3.0L EcoDiesel V6 is the most efficient and one of the most powerful engine options for both the 2014 Jeep Grand Cherokee and upcoming Ram 1500, it would make good sense that this powerful yet efficient oil burner would also be offered in the large company sedans. Mercedes Benz, Audi and BMW have slowly introduced their more popular diesel powered sedans into the US market and with a rapidly increasing number of diesel models including the likes of the Chevrolet Cruze there really doesn’t seem to be a good reason why there wouldn’t be an EcoDiesel Chrysler 300. Oh, and the Chrysler 300 is sold as the Lancia Thema in Europe and it is available with either the Pentastar V6 or a similar diesel V6 – so there is no question about the engine fitting into the car and performing well. According to Mr. Chehab, the hanging point on the Chrysler 300 EcoDiesel is cost and final pricing. The EcoDiesel option in the 2014 Jeep Grand Cherokee costs $4,500-5,000 depending on the trimline and if the price hike for the EcoDiesel was near the same price point, it could prove to be too much for large luxury sedan buyers. The costs of the EcoDiesel in the new Grand Cherokee (and the upcoming Ram 1500) is justifiable because it is not only very efficient but it is also very powerful so buyers can enjoy the fuel economy of a V6 with the towing and hauling capabilities of a V8. That is ideal for many large SUV and half ton truck buyers but the majority of new Chrysler 300 buyers probably arent that concerned about the ability to tow so there isnt the same level of benefit of having the EcoDiesel in the 300 as there is for the Grand Cherokee or Ram. The current Chrysler 300 sedan is available with the 3.6L Pentastar V6 or the 5.7L Hemi V8. The Pentastar offers 292 horsepower and 260lb-ft of torque while the Hemi packs 363 horsepower and 394lb-ft of torque. For comparison, the 2014 Grand Cherokee EcoDiesel packs 240 horsepower and 420lb0-ft of torque but more importantly, the EcoDiesel is the most efficient engine in the Jeep lineup. We can expect that the 3.0L V6 diesel would also be the most efficient option in the 300 sedan lineup but it stands to be seen whether the sedan market would be as memorized by the work horse abilities of the low horsepower, high torque turbo diesel. While Jeep and Ram owners can appreciate the towing capacity of the EcoDiesel while bracing for the $4,500-5,000 price tag, Chrysler 300 owners will most likely be buying the diesel option primarily for the fuel mileage and $5,000 might be too steep a price for a couple extra MPGs. In addition to the fact that the Chrysler 300 is sold overseas as the diesel-powered Lancia Thema coupled with the arrival of the EcoDiesel Grand Cherokee – there is also the point to be made that Fiat loves diesel engines. Company chief Sergio Marchionne has frequently shown favor for super efficient modern diesel engines over costly hybrids and with the success of diesel powered Fiat family models in Europe, perhaps even the highest company brass would like to see an EcoDiesel powered sedan here in the US.